Ideal for artists at all skill levels, the Fredrix Pro Series features the world-famous Tara/Fredrix Dixie #123 12 oz cotton duck canvas, double-primed with acid-free acrylic Titanium gesso for professional results. Available in a wide variety of sizes and three profiles — including a traditional 7/8" profile, a 1-3/8" gallery profile, and a 2-1/4" museum (deep) profile — every canvas is stretched on kiln-dried stretcher bars, with extra bracing for added support. 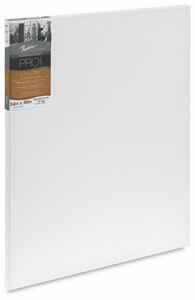 Fredrix Pro Series Dixie Stretched Canvas — a versatile option for oils, acrylics, and alkyds.